Who are we, and how did we start? Tregoyd Trekking centre was started in 1958 by Mr E L & Mrs D G Jones. 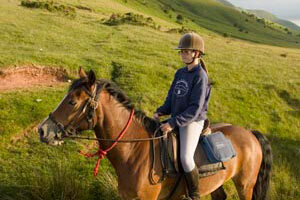 The idea grew from the success of pony trekking in Scotland which had not long started. Mr. Jones who just started farming after getting married in 1955, and had moved away from his father’s farm to farm part of the Tregoyd Estate by himself, thought that this might be a great opportunity to develop a pony trekking business in the Brecon Beacons, Wales. Mrs. Jones had a love of horses and the two of them worked hard to turn it into the success it is today. 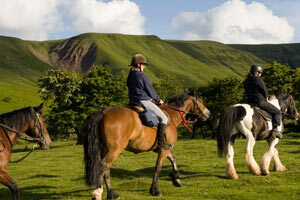 Stocked with quality sure footed ponies and horses the business has developed into a highly popular place to come riding and trekking in the superb surroundings of the Brecon Beacons National Park. Their son Haydn Jones now runs the business and is supported by a team of qualified and knowledgeable staff. Since the business has been in Haydn's hands he has developed a successful livery yard and riding school as well as building up the trekking to offer riding holiday packages. At the end of 2014 and ready for the start of the 2015 season, we moved our office away from Tregoyd Farm and are now completely based at Lower Cwmcadarn Farm,from where we have been running treks since 1970 and where our bunkhouse is also based. The centre is accredited and inspected by Wales Trekking & Riding Association, the British Horse Society, AALS and Visit Wales and we are licensed and inspected by Powys County Council. Haydn Jones - Owner of family run business established in 1958. Involved in every aspect of the business and when not working is a keen motorcyclist and a member of the Brecon Beacons Climbing and Mountaineering Club. 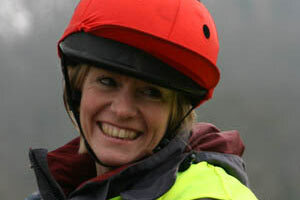 Carol Church - Chief Instructor and Centre Manager. Carol has been involved with Tregoyd Mountain Riders since 2006, when she first brought her horse to us on livery. Fast forward and Carol is now in charge of all the horses.